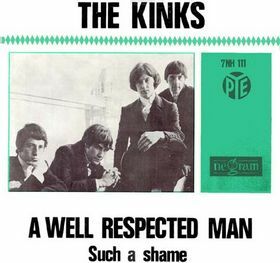 A Well Respected Man is a song by the British band The Kinks, written by the group's lead singer and rhythm guitarist Ray Davies, and originally released in the United Kingdom on the EP Kwyet Kinks in September 1965 (see 1965 in music), but the song was released as on the album Kinkdom in the United States. The song was also released as a single in the US and Continental Europe. A Well Respected Man remains one of the band's most popular and best known songs. It is one of four Kinks songs included on The Rock and Roll Hall of Fame's list of the 500 Songs That Shaped Rock and Roll along with "You Really Got Me," "Waterloo Sunset," and "Lola". Davies composed the song based on a negative experience with upper class guests at a luxury resort where he was staying in 1965. He crafted the song to mock what he perceived as their condescension and self-satisfaction.